Linda Marrinon's work is characterised by its merging of a cartoon-like style and references to classical painting, and by a distinctive, often low- key humour. She mixes up the conventions "of abstraction and figuration, of cartoons and classicism, of heroes and clowns..." (Chris McAuliffe). In both her paintings and sculpture, Marrinon invariably depicts people or animals in slightly absurd scenarios as in 'Short Man with Two Dogs'. 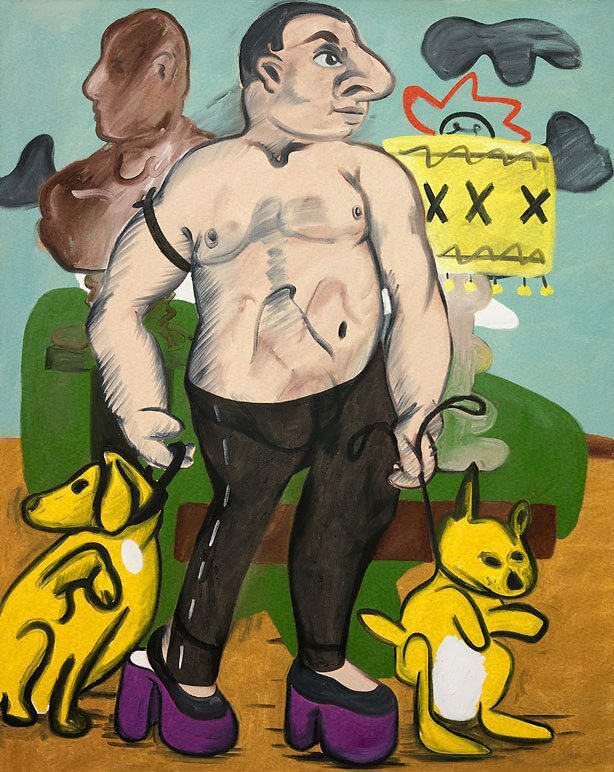 Here a half-naked man is shown wearing purple platform shoes and clutching at the leads of two yellow dogs, one of which is remarkably kangaroo-like. This painting is typical of the artists' work from the period where the male body is presented as an exaggerated, soft and almost bulbous form. In this way Marrinon's work undermines the heroic nature of masculinity as traditionally presented by art history. Another clue to this gentle parody of both masculinity and art history is conveyed in the sculptural portrait bust that appears behind the man but looks in the opposite direction to him. In her combination of caricature and comment, or in other equally relevant words, surface and depth, Marrinon's practice has charted a particular trajectory in Australian art practice. Her work has been associated with the renewal of interest in pop art in Australia in the 1980s, and in particular with the suburban references and an urbane wit that also appears in the work of contemporaries such as Vivienne Shark Le Witt and Howard Arkley. Marrinon's gently ironic watercolours, paintings and sculpture both gently parody their chosen subjects as well as our tendency to feel more comfortable with the vernacular and with failed aspirations than with high culture and success.